Meatballs are a staple of any holiday table, it seems. You see the warming sat full of the same old, same old meatballs, ready to be filled with sticks and piled on your plate. 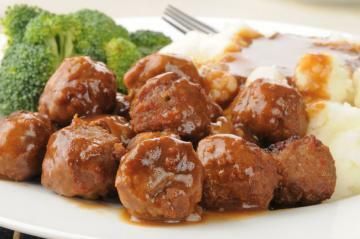 There are ways to save your meatballs recipes to make them more enjoyable for your guests. Here are 3 ways to make the most interesting meatballs for parties or special dinners. 1. Stay away from ground beef and go for something different in their meatballs. Try ground turkey instead of beef. Tear the bread into 1-inch pieces and place in a medium bowl. Squeeze the bread later. In a bowl, combine the egg whites, grated cheese, parsley, salt, garlic powder and pepper. Add ground turkey, onion and egg mixture into the bowl with the bread. Mix the ingredients with your hands, but do not over mix, as this will create harsh dry meatballs. Portion of the mixture of pellet with a small ice cream scoop or melon baller in size 20-24 nut balls. Place on waxed paper lined baking sheet. Soak hands in a basin of cold water (to prevent the mixture from sticking) and roll each ball in your hands to smooth and compress gently. Cover with a sheet of parchment paper and refrigerate for at least 15 minutes, allowing meatballs to fix A little. Serve with cranberry chutney for a thanksgiving, like the mini-treatment. 2. Another way to start your meatballs is something called porcupine meatballs. Combine ground beef, rice, onion, a cup of water, salt and pepper quarter with your hands to ensure that all links. By continuing to use your hands, mix form meatballs - a dozen average size. Add the meatballs to the net. Reduce heat, cover and simmer over very low heat for one hour. Serve hot and enjoy. 3. If you want to serve delicious meatballs and something healthy, look no further than the buffalo meat. In a bowl, mix all ingredients together. Cook the meatballs in a preheated oven at 400 degrees for 12-15 minutes and serve hot.